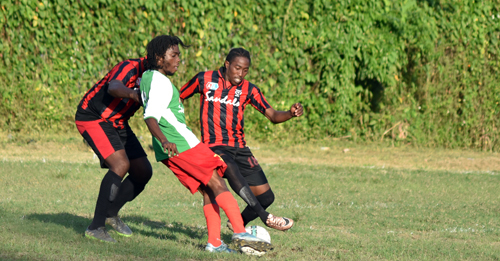 Goals in each half by Jovel Walters and Markland Llewelyn proved decisive as Melbourne made a winning start to the 2018 Sandals/ATL Senior Football League with a comfortable 2-0 win over longtime rivals Seba at the UDC field. Walters broke the deadlock in the 39th minute before Llewelyn sealed the points in the 64th. With the three points, Melbourne take the early lead atop the standings, which will this year be a played in a straight League format. Both teams were quick from the start and created chances to open the scoring, but each were thwarted through faulty shooting and bad decisions in and around the penalty area. Seba should have gone ahead in the 12th minute when a ball across the face of goal bubbled past the head of an onrushing forward. Within seconds, Melbourne got their chance, but a well-weighted ball across the face of goal was not met at the back post by the late-arriving attacker. The red-and-black-clad Melbourne then took charge of the midfield and began to string the passes together, moving effortlessly around their opponents. Melbourne struck the post and had the Seba back line in a mix as they pressed for the go-ahead goal. With the first half reaching the halfway stage, Melbourne breached the Seba backline through a sweeping move down the right-hand side of the pitch, forcing the Seba backline to retreat. Walters, on the end of the move, dipped past three defenders before uncorking a torrid shot which went in off the underside of the post from just outside the 18-yard area. Melbourne took charge of the encounter from there on, carving out chance after chance but failed to capitalize. They made the points side just after the hour mark when Llewelyn stuffed home to make the score 2-0 and the three points safe for the many-times semi-finalists and finalists. It was the first time in three seasons that Melbourne were making a winning start to the season and also ended the three-game winning streak of the Seba team dating back to last season. The action continues on Friday, January 26, with two matches. Club Stars against Marl Road at Spot Valley, and the usually unpredictable Lilliput Rovers hosting last year’s beaten Heights, who have been severely weakened by the exodus of some key players to clubs in higher divisions. Seba, Revelation, Mountain Villa, Marl Road, Melbourne, MoBay City, Lilliput Rovers, Club Stars and the promoted pair of Irwin and Somerton are the teams listed for this year’s competition. In the meantime, President of the St. James FA, Gregory Daley, says he is pleased with how the kick-off went, noting that “it was a smooth start”. “It went off well, with just minor hick-ups. We were forced to start the first game a bit later than was scheduled, but that was through no fault of ours, but all in all, it was a good opening round,” he told the Western Mirror. “We, (FA) are hoping and expecting a really good season with some good brand of football as some of the teams have strengthened their rosters with the inclusion of some good players and with that, we are expecting a bit more competition in the matches,” he noted, “but we just have to wait and see,” he further added.